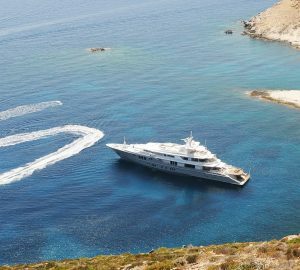 The 73.50m (241' 2") Custom Superyacht was built by Nobiskrug in 2008 and last refitted in 2015. 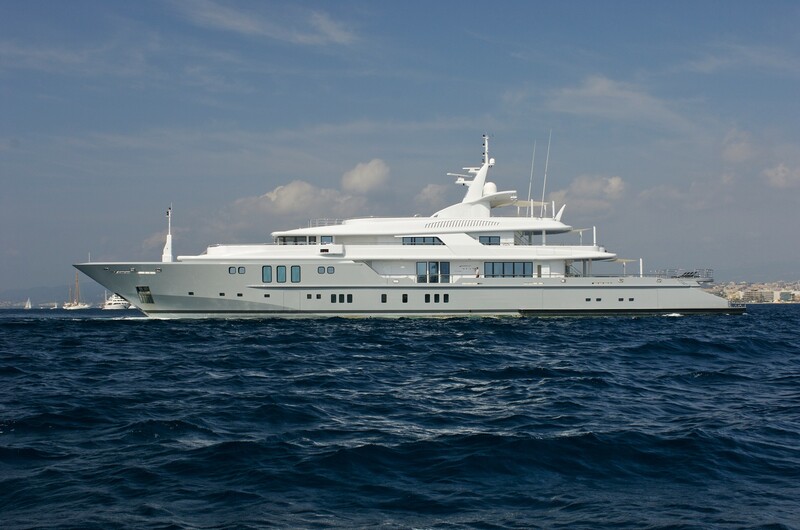 Constructed with a steel hull and aluminium superstructure, she has naval architecture by Newcruise, who also completed her interior and exterior styling. 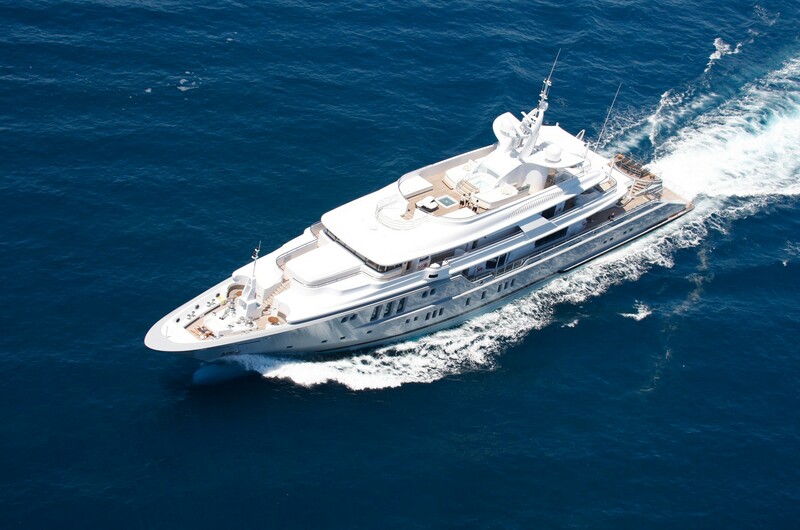 The accommodation is designed to sleep a maximum of 12 charter guests over six spacious en-suite cabins. 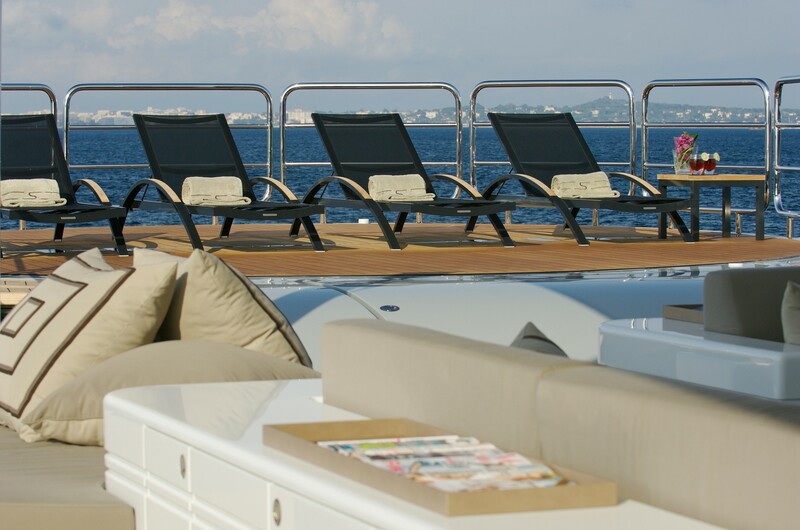 The lower deck swim platform has plenty of room for armchairs or sun loungers for guests to enjoy the views and the sunshine close to the ambient sounds of the sea. 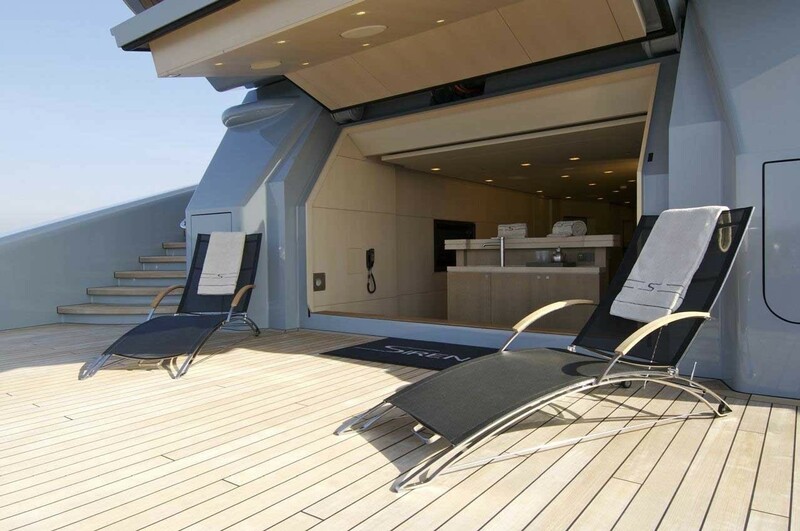 Staircases lead up to the expansive main deck aft, where a casual alfresco lounge has aft, port and starboard sofas around a coffee table, plus s sun pad on either side behind. Farther forward, bar stools surround the indoor/outdoor bar. 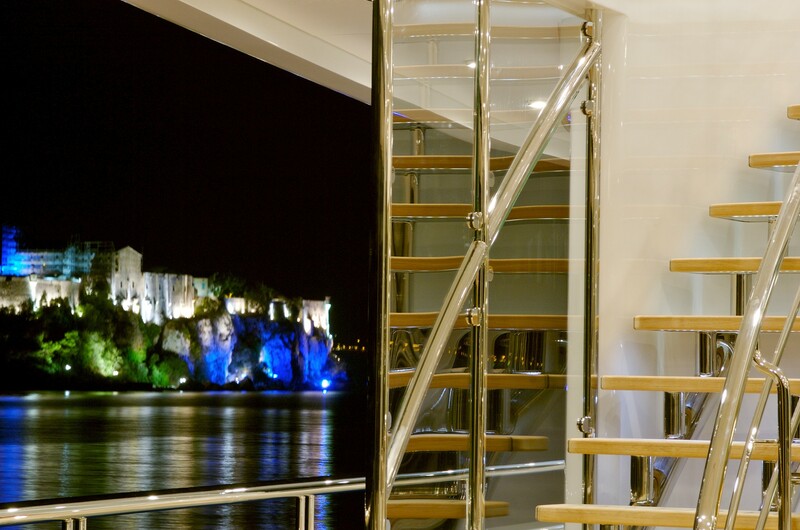 Staircases from the main deck connect the floors up to the sundeck aft; between the two, the upper deck aft is designed for alfresco dining and sunbathing with an abundance of large sun pads along the stern. 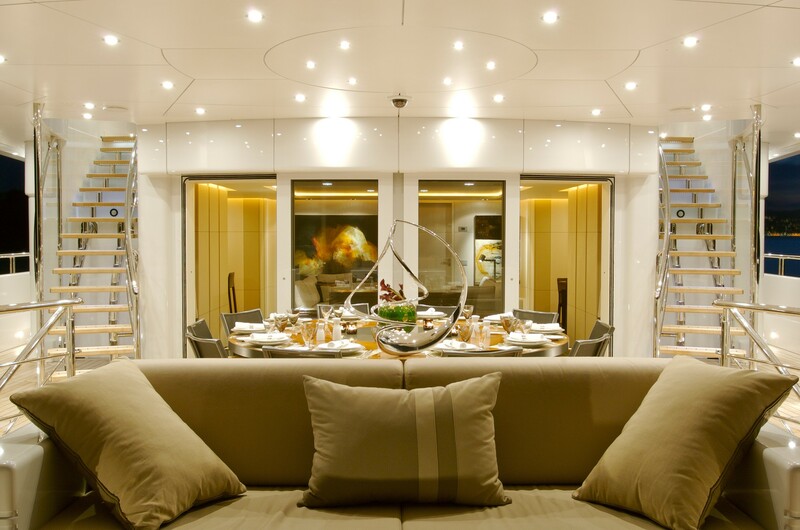 On the foredeck, two circular tables on the port and starboard sides are each surrounded by a C-shaped sofa so that guests may take in the forward views throughout the day. On the sundeck, guests can unwind and spend time sunbathing on one of the many forward or centrally located sun pads, between which is an inviting Jacuzzi. 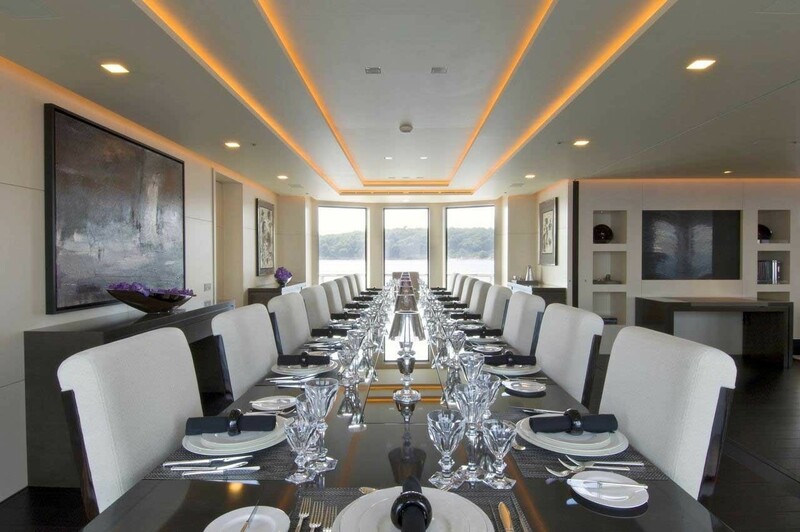 A forward viewing platform ensures that the motor yacht is an ideal choice for event charters, while along the stern there is an abundance of additional seating around three tables for drinks and casual meals with friends, family and visitors while admiring the location's landmarks. 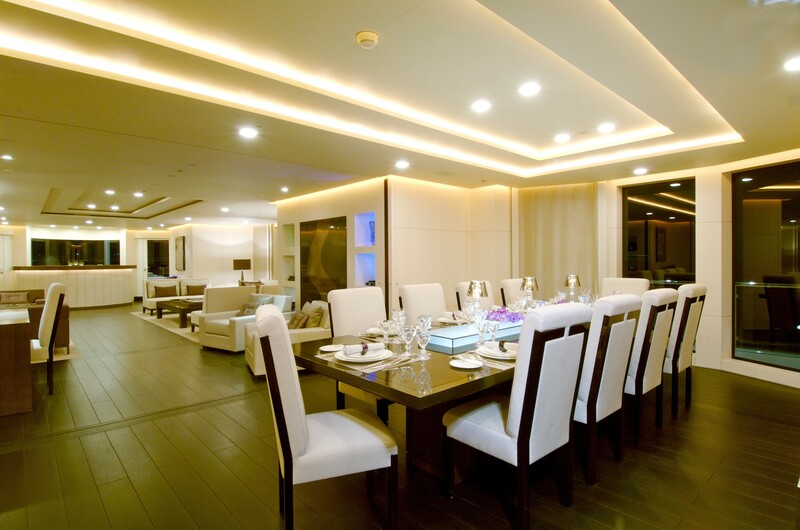 Newcruise has chosen a stately modern colour scheme of dark brown wooden flooring against cream-coloured walls and furnishings with silvery-mauve accents. The lower deck stern contains a beach club with a bar and two L-shaped sofas, providing a refreshing shaded space after sunbathing on the swim platform. 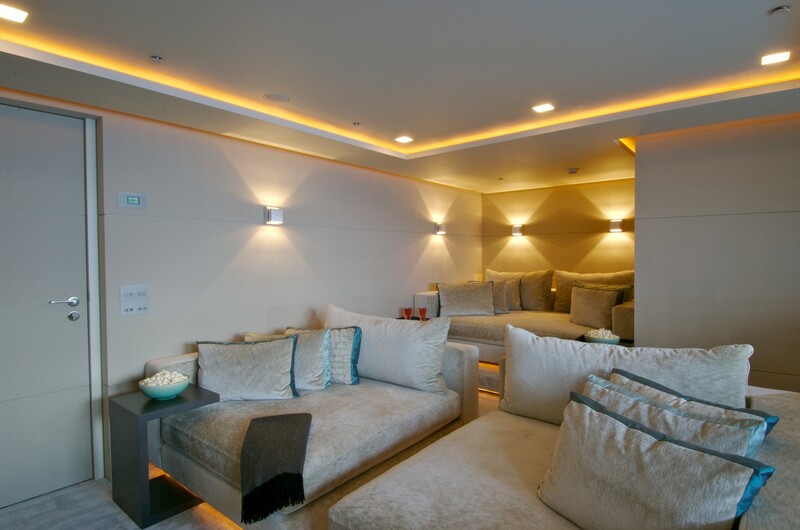 Forward of the beach club is a storage space for two large tenders and the motorised water toys, which are launched and retrieved via side-hatches a hallway and staircase divides this space and connects the beach club to the main salon aft. 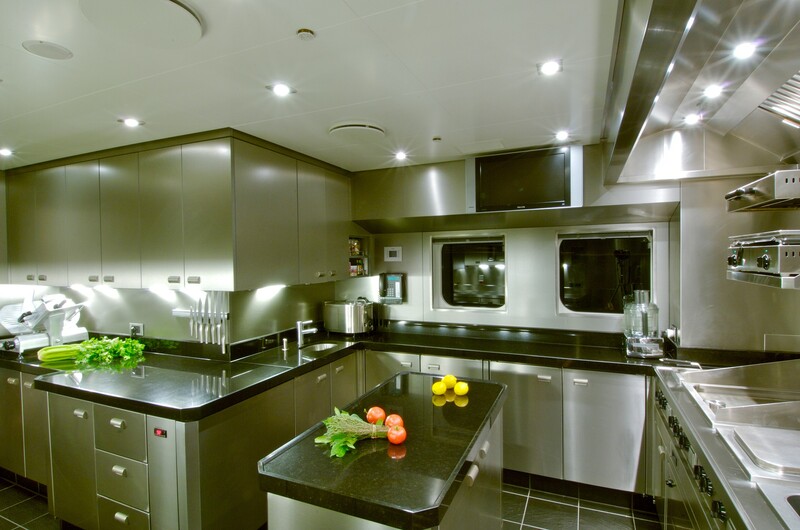 Amidships is the engine room and the forward deck space contains accommodation for guests with three double en-suite cabins and an en-suite double cabin convertible to a double. 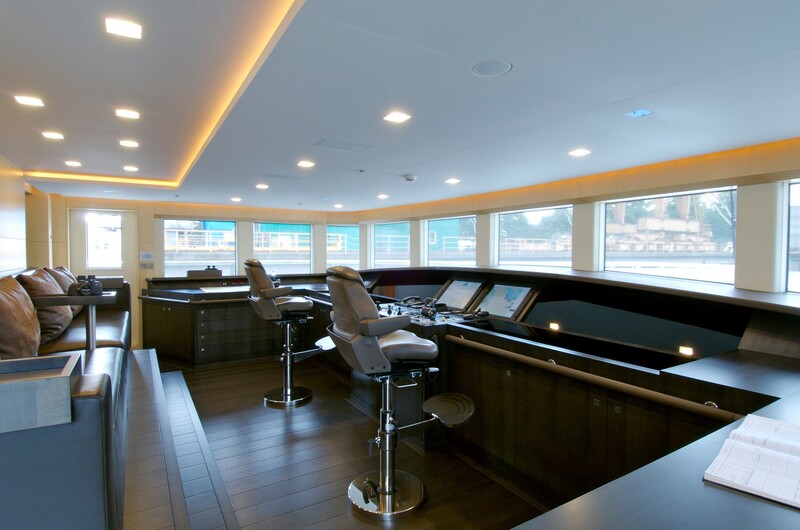 The crew accommodation and facilities in the bow complete the layout of the lower deck. 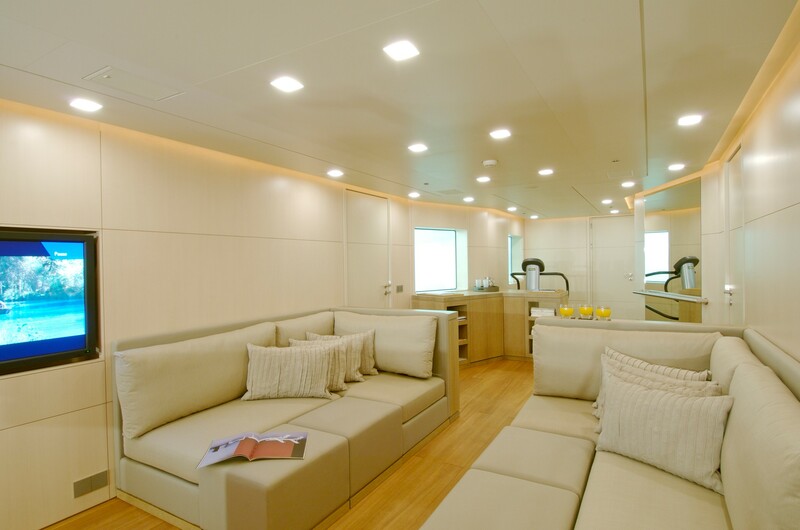 A full-beam Master suite which commands excellent forward views can be found on the main deck forward. Inside, there is a fold-down terrace and also 'his and hers' bathrooms, a walk-in wardrobe and a spacious open-plan lounge and study. The open-plan main salon places the formal forward dining is forward, where up to 16 guests can enjoy plenty of natural light and great views from full-height windows. A small connecting corridor containing two armchairs leads to the voluminous lounge, within which a symmetrical appearance is created by mirroring elongated sofas and armchairs around a coffee table. 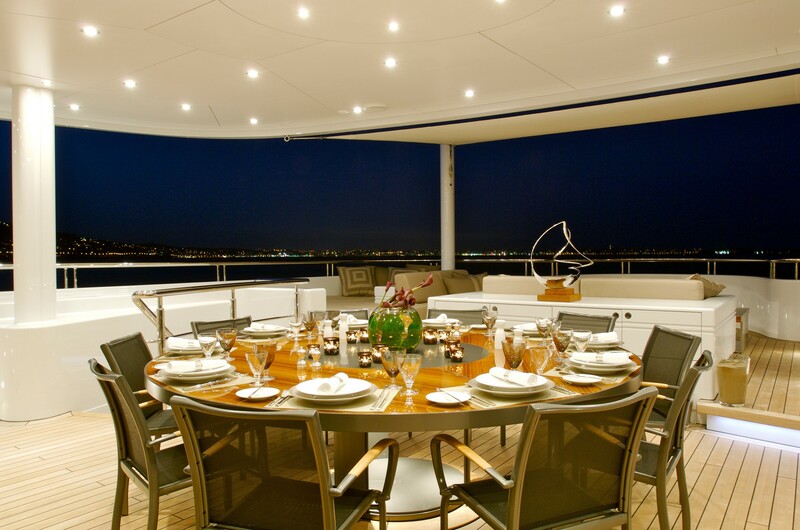 This allows for separate group conversations and provides additional seating for visitors while hosting a party on board. An indoor/outdoor bar is placed between the aft sliding doors to serve guests as they move about the social areas. The upper deck contains the forward helm station and the Captain's cabin. 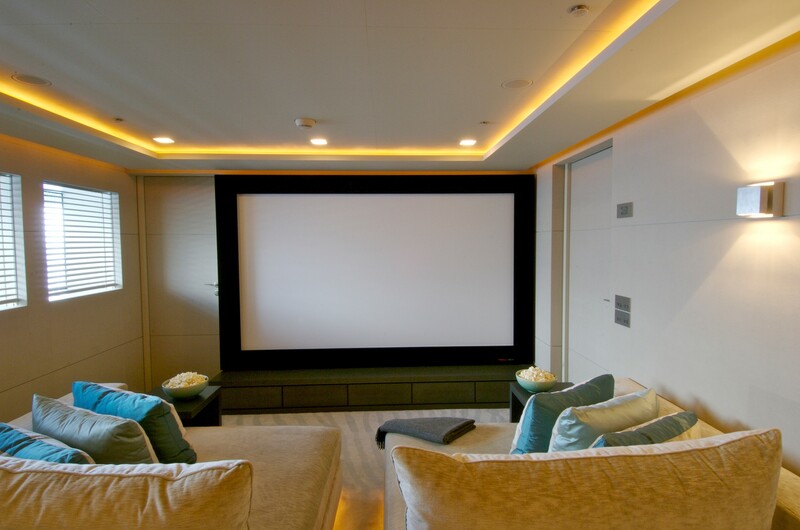 Behind the foyer, a VIP stateroom with en-suite facilities takes up the starboard side, opposite of which is a cinema with comfortable armchairs and a section at the back where guests can lie flat. 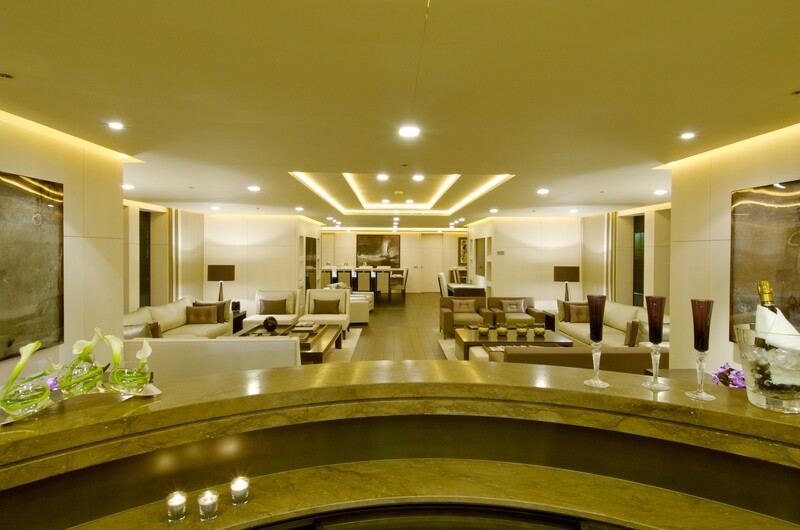 Behind, the sky lounge contains two plush L-shaped sofas around a low coffee table and on either side is a games table and a wet bar. On the sundeck, an interior gym provides an air-conditioned space for guests to work out while taking in the spectacular elevated views. 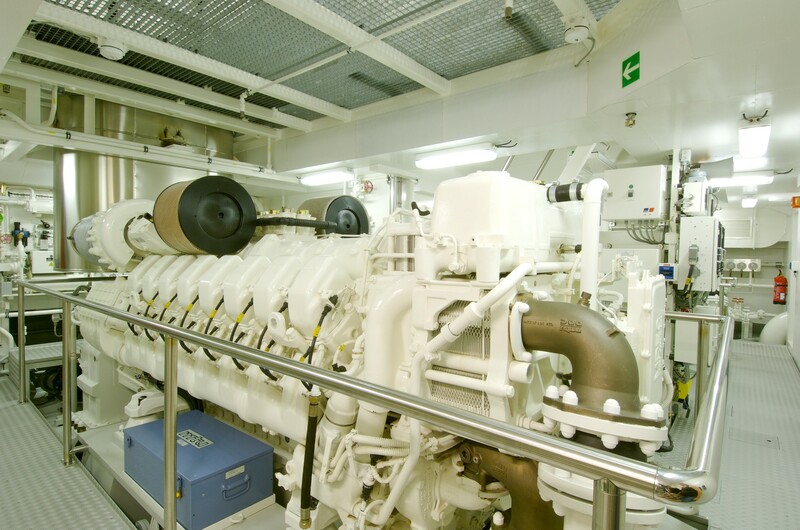 2 x MTU 16V4000 M60 allow for a cruising speed of 14.5 knots and a top speed of 17 knots. Up to 12 guests are accommodated over 6 large en-suite cabins: 1 Master suite, 1 VIP stateroom and 3 double cabins, one of which is convertible to a twin cabin. There is also a Pullman berth. Approved RYA Water Sports Centre, air conditioning, wi-fi.